Alright! Thanks to Eyespy Toys, I was able to get my hands on a Launch N Attack Annihilator and a Target Launcher. Cost: $14.99 - $19.99 depending on vendor. 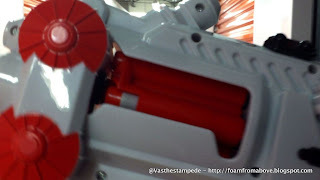 The disc launcher attaches to the blaster on the side, and you pull the rip cord which spins the disc that lifts it into the air. Low amount of extra space in chamber to accommodate other darts. This is literally sized for their ammo alone. The Launch N Attack rotating chamber only has enough clearance to barely cycle its own brand of darts through the blaster. You can't use other brands of ammo with it unless you force and manually rotate the blaster through each shot. Not the most efficient if you're in a pitched game where each shot counts and every movement means the difference between tagging or being tagged. In the heat of things, finding this out could be wildly frustrating. You can see the Launch N Attack Darts are just a touch shorter than Nerf ammo, hence the lack of compatibility. One other quick note is the Launch N Attack Darts are a harder plastic/rubber on the tip, not as much give as the Nerf ammo tips, so you know if you decide to shoot your friend unawares. Disc that comes with the annihilator, Rapid Attack Disc, and Nerf Disk Shot disk. Utimately, how do I feel about the blaster? With the market going the way it's going, to see a normal 20-30 range out of a blaster knowing there's farther shooting stuff out there for just a few bucks more is a tough sell, in my opinion. Never mind the lack of interchangeable ammo usage which makes using this in a game of tag a tough choice. From a playability standpoint, the addition of the target disc is a good incentive to use it for target practice/reaction testing for yourself, or if you're bored want a mobile target to shoot at. I will definitely continue to keep an eye on this company though, as I like where they started, but definitely hope to see a more current take on their blasters considering what's out there now.